If you were born in the 70’s or earlier you probably remember when the term Bug Out Bag was virtually unknown. Nowadays at least three out of four people you meet in a social context are likely to be familiar with the term. It’s a sign of the times in which we live. However, we don’t hear a lot about the concept of varying the items in one’s BOB depending on whether it’s an urban or rural environment the person will be dealing with. I won’t spend time going over all of the items one should have in his/her pack as I suspect this is well covered ground for most reading this article (CLICK HERE to make your custom bug out bag list & have it sent straight to your inbox!). Whether one is in the city, countryside, or deep in the wilderness, much of the pack contents should be the same. Much, but not all. I have read advice about the best items to select for a BOB as if the general environment where it will be used is irrelevant. In my view this is akin to having a handyman show up to your home with only a small tool box without telling him whether it’s a plumbing or an electrical problem he will be addressing! Any resources available to respond to same will be overwhelmed, and possibly unavailable altogether. Worse yet, in my opinion there is likely to be a synergistic effect if the scope of the disaster is severe enough to severely impact the infrastructure (including police response). Those who live their lives as predators (i.e., gang members and others) will in all likelihood become aware of the lack of first responders far more quickly than the rest of society, and will take full advantage early on. I would like to be proven wrong, and perhaps I will, but don’t count on it. Making a Bug Out Plan that is specific to your locality is vitally important. You want to include the intricacies and potential dangers that are local to where you are going to be operating. Be equipped to determine alternate routes while on the move (or at least with little time to make route changes). Have the means to defeat the varied physical obstacles potentially to be encountered. Have the tools capable of extricating one’s self or others from confinement due to structural collapse, vehicle collisions, or other situations more common in urban disasters. Be equipped to create large holes in interior walls to facilitate escape from threats present inside the building. If escape/avoidance is not possible, have an effective means to defend against violent attack. Capability to process wood for starting and maintaining fire. Means to put together basic (short term) shelter. Less important, but worth mentioning, is the means to fashion additional crude tools (e.g., hunting devices) to aid in survival conditions should the scenario turn into a longer term one. A map of the city where one works (as well as where one lives if not the same city) is imperative. Unlike as is often the case when traveling through rural or even wilderness locations, urban travel after a disaster can present fluid situations chock full of potential extreme danger requiring sudden and unexpected route changes. No matter one’s skill and/or type of weapons he/she may have, avoidance of conflict at virtually all costs is going to be the better option. And in the process of changing direction (perhaps multiple times as part of evasion), even the best of us can find ourselves disoriented. Pack a map! And have at least one (preferably two) reliable light sources to study the map during darkness. I have found that unlike when navigating through wilderness, a small inexpensive compass will suffice for city map work. Unlike when hiking through wilderness locations, having/wearing high quality state-of- the-art gear while walking through heavily populated areas when the infrastructure is down is a mistake. Wearing the latest “tacticool” pack can be an equally big mistake. Since two-legged predators will be aware of the increased opportunities the conditions have created for them, the less attention one invites, the better. I know from experience that many street smart bad guys have a surprisingly keen eye for quality gear, even when it comes to items they know almost nothing about. Don’t advertise your cool gear if you can possibly help it. Wearing a pack is likely to draw at least some extra attention no matter what—this is largely unavoidable. But donning a pack that appears to be very used, or even dirty, is a better option than a brand new pack. And a “plain Jane” civilian pack is more likely to ride under the radar than a tactical pack. Ditto all of the above when considering the clothes you will wear during these conditions—especially shoes! Learn and practice your Gray Man/Woman Skills now to fly under the radar when a disaster strikes (Click HERE to learn how). On many occasions I have watched other first responders use a variety of tools when handling emergencies. I have also used some of these tools personally to gain entry into semi-fortified homes during the course of police work. Other than issued weapons (police) and medical equipment (fire department/paramedics) the tools used most often were those designed to defeat barriers typically encountered in cities (everything from car doors and windows to steel home security doors). Although you might convince yourself you would not stop to help another in need if it delayed your bugging out from a dangerous environment, you really never know until faced with that scenario. Moreover, you just might need the means to get yourself out of a jam. With the growing threat of terrorism and active shooter incidents, being equipped to create a travel path (breaking out a hole to crawl through) between a building’s interior rooms is a reasonable preparation. There are many scenarios that could prompt the need to bug out through an urban area—a massive terrorism incident is certainly one of them. I am trying to make the case for not including a large knife in favor of a rugged tomahawk. Never mind that many “experts” insist on having a large hard use survival knife in any and all BOBs. A person is better off with an affordable tough tomahawk for urban scenarios any day of the week. And a suitable “hawk” can be had for about half the price of any survival knife capable of doing other than traditional knife chores! Estwing’s Black Eagle Tomahawk fits this bill. It is not very attractive, and the workmanship shows only minimal attention to finish and fine symmetry, but I can personally attest to the tool’s capability. I have used the spike end to break car window glass, punch through heavy steel mesh and car trunks, as well as breaking a six inch diameter hole in a cement cinder block (I encountered no steel rebar however). I have also used this “hawk” to pry apart two-by-fours fastened with 16D nails. After all of this, the business ends of the hawk’s blade are still not much worse for wear (cosmetic damage only). 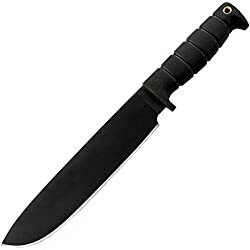 Does anyone think any of the better quality survival knives out there could perform these tasks without causing damage, or even breaking, the blade? I once watched a fellow patrol officer show off his $250.00 tanto bladed knife by punching through the steel door of a typical gym locker. Worked fine. He repeated the feat an hour later to show off his new knife to another observer. This time it significantly damaged the blade’s tip. He was so angry we couldn’t talk to him for over an hour. Knives simply are not meant to be used to defeat steel, concrete, or even glass! 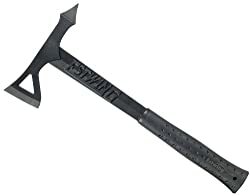 Check out our article on Picking The Best Tomahawk For Your Bug Out Bag HERE. I have no financial interest in Estwing, and there may be other equally well performing hawks out there for a similar price (about $35 HERE on Amazon), but I have not found them. I have discovered far more expensive hawks but never purchased or tried them. And I have tried a couple of the lighter hawks sporting plastic handles, but found their performance lacking—seriously so! The only real downside to the Estwing is its weight. At 27 ounces it is admittedly heavy. The Becker BK2, a popular hard use survival knife, weighs about 10 ounces less, but the capability of the Estwing hawk makes it well worth these extra ounces in an urban environment. I would feel adequately equipped If my urban BOB cutlery items were limited to a robust hawk and my multi tool (a must for any BOB, regardless of setting, check out our Guide for Picking The Best Multi Tool HERE). The former could handle any rough cutting tasks, while the latter’s small blade could deal with finer cutting chores. 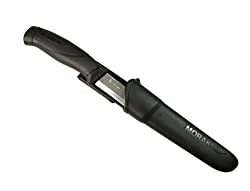 If someone absolutely insisted on carrying another knife for more traditional cutlery chores, a Mora Kniv would fill the bill for about twenty dollars. And it’s doubtful the Mora’s extra 4 ounces (including sheath) would be noticed. Finally, a hawk can be used for protection against a violent attack when all else fails. As for whether a hawk or a good knife would serve this purpose better…well, that really depends on the individual as well as the circumstances. After all, neither is the best tool for self-defense, for more reasons than one (a topic for another article). Let’s just leave it with the idea that a hawk can be used as an effective self-defense tool in a pinch. Being able to cut through standard chain link fence could prove to be the difference between escaping a very bad scenario and falling victim to one. I can conjure up a half dozen scenarios where a person might need to escape a threatening situation, seek shelter, or simply shave off valuable travel time by cutting through a fence. Chain link fencing is ubiquitous in virtually any urban area. Unfortunately, I have found multi tools fall short of being capable of cutting chain link in a reasonable manner of time and effort. 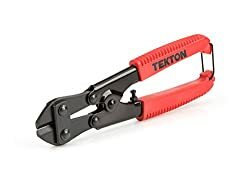 Find the smallest/lightest tool capable of cutting chain link in one clipping action (Tekton makes a good pair, see them HERE). Bending or sawing through wire takes too long under most scenarios that would warrant cutting fencing in the first place. You’re probably asking, “Didn’t he just cover this issue?” I did—for the urban setting. However, after spending a good deal of time in the wilderness (including several nights without a tent), both recreationally and as a search & rescue volunteer in the California Sierras, I prefer a good large knife in any environment other than an urban/suburban one. Surviving in the wilderness doesn’t have to be hard…IF you have the right tools and skills. Hundreds of years ago, the tomahawk’s philosophy of use was multi-faceted. Only one of these intended functions involved the processing of wood for structure building or building fire. The hatchet (hand axe), on the other hand, was designed for one purpose only—processing wood. As one could predict, the hatchet proved to outperform the tomahawk for wood processing, while the hawks performed better as weapons. I have tried many a “woods hawk” over the years, but in the end I have found quality hatchets of similar weight simply do better with wood chores. Given the points made in the “Disaster Planning” section of this article, the hatchet gets the nod over the tomahawk for a rural BOB. All of the above notwithstanding, I prefer a large survival knife to a hatchet for my rural BOB. The hatchet will almost always out chop a knife of similar weight, but this isn’t the end of the story. When it comes to cutting wood a small lightweight folding saw offers a better choice than a tool that chops the wood to the desired length. But the primary element of fire wood preparation involves splitting the pieces for fire building. I know there are many (far more than hawks that can compete with the Estwing) quality large survival knives that can also perform well when it comes to wood prep. I would, however, urge anyone selecting a fixed blade knife for his/her wilderness BOB to go with a seven inch blade or larger. This makes splitting wood of three inches or larger diameter much easier than using a shorter blade. To see our comprehensive guide on choosing a fixed blade CLICK HERE NOW. When travelling through areas where there are no street signs, or even no streets, a higher quality compass becomes very important. Land navigation where there are no streets is a skill that demands time and effort to learn. Knowing how to navigate through these types of surroundings using a topographical map is not for the novice! If at all possible, stay on a road, or at least keep the road in sight. 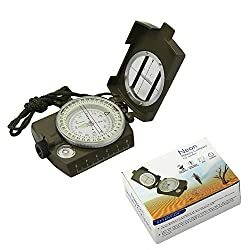 In any case, a rural BOB should always include a high quality compass. This should be a “no brainer”. When bugging out through an urban setting under circumstances where you might have to spend some resting hours in the dark, it might or might not be advisable to make a fire. Fire attracts the urban predators, while it tends to repel the four legged type. Furthermore, having a fire in a location where there is no man made shelter available is uniquely important. In addition to heat and minimal light, it is well documented that a small fire can provide a significant psychological boost for the solo survivor/traveler. Don’t forget to Include a few petroleum jelly soaked cotton balls as well. They will ignite with a decent spark (paper and many other tinders requires actual flame) and continue to burn for several minutes. If you want to learn 6 ways to start a fire WITHOUT matches, CLICK HERE. Any BOB will include a container to carry water (I’m assuming this goes without saying), so why not have one that can also be used to heat or boil water? 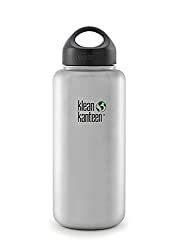 A single walled stainless steel water bottle like the Klean Kanteen (or similar design) products can be placed over open flame or coals to heat water. Boiling water is a dependable way to kill any pathogens (chemical contamination is another issue). I once used a heated steel water bottle as an improvised hot water bottle to ward off hypothermia in a snow cave. Not sure if it was literally a lifesaver, but I was sure glad to have it. Make sure to remove the cap before heating water to avoid a pressure build-up and the subsequent likely explosion. My experience has convinced me that for urban applications, escaping the locality as fast as possible should be the key objective in a SHTF scenario. Sheltering in place, even for a short time is likely to be catastrophic. In my view a robust tomahawk, coupled with a good multitool and small wire cutters, is close to the perfect set of BOB tools—but this could be surpassed with a new invention at any time. For rural/wilderness environments, night travel is far less desirable and sheltering through the night(s) becomes a priority. Creating fire and crude shelter is paramount for the wilderness trekker under any circumstances. For this application, a large survival knife becomes the tool of choice, edging out both the tomahawk and hatchet in the versatility and safety categories. The very fact that those reading this article have probably already put together a bug-out bag at all places them way ahead of most. Having a readily accessible BOB, even if not perfectly constituted, is 90 percent of the game in itself. However, it’s still a good idea to evaluate equipment choices every so often, keeping a philosophy of use mindset while doing so. If you are ready to build your custom Bug out Bag List, click on the button above now. Do you have an item that is a “must have” for your urban or rural bug out bag? Can you think of any other big differences between what you would pack for these scenarios? Let us know in the Comments Section below, thanks! Frank LaFlamme spent almost a quarter century in law enforcement in the Los Angeles area serving for three local agencies as well as an assignment with the DEA Los Angeles office. His assignments included uniformed patrol in one of the most violent areas in California, narcotics investigation, gang enforcement, robbery and homicide investigation, high risk warrant service, and a terrorism liaison officer position. Upon retiring, Frank volunteered as a Search & Rescue “ground pounder” with a sheriff’s department in the Sierra Nevada Mountains near Yosemite National Park. Additionally, he started a small disaster preparedness consulting business called F& D Consulting. In 2014 he published a novel titled EMP Los Angeles (an Amazon best seller for a while, CLICK HERE to see it), a raw and gritty cautionary tale of a post EMP attack Los Angeles. Click on the book to go check it out on Amazon! Note: This article was contributed by Richard Beck from TheOutdoorsPro.com. Read more about him in the About The Author section below. Within your lifetime, you may encounter many different kinds of situations where you will need to rely on your own survival preparedness. Therefore, it is essential that you have the skills to survive on your own. Some of these situations include snowstorms, earthquakes, EMPs, nuclear, and many others. Being prepared for these situations is the first important step in survival. The first thing that you will need is a 72-hour bug-out bag for each member of your family. This bag should be kept with the family member at all times. If you have a child, and you do not live extremely close to the school, then you need to leave it at a friend’s house very near the school. Your family bug-out plan should include a safe place for your kids to go near their school, in case you are delayed in getting to them. As the name suggests, this bag will help the person survive during the first 72 hours. Even assuming that it is safe to go outside, the government and other charities have admitted that it will take them that long to get organized and on site. Your bug-out bag should be packed and ready to go at all times. There are numerous things that need to be in your bug-out bag, but the two most important things are food and water. While that may seem obvious, there are at least five other things that you should keep with you at all times. While they do not need to be gourmet, your survival meals DO need to sustain you until you can secure an alternate food source. Numerous governments around the world are stockpiling food. Imagine the very real scenario where you cannot go to the store and buy what you need. For example, you may be ordered to stay in your current location. Even if you are brave enough to head out, if there is no electricity, you cannot buy gas to get you to the store nor will stores be able to get gas to transport groceries. Therefore, you need to be buying extra food until you have a year’s supply of food, A great place to start, however, is to develop 30 days worth of food. Dehydrated meals are a lightweight option for stocking your bug out bags. Just add boiling water to these Mountain House dinners and you have a hot meal. Click to view on Amazon. While you can survive for a short time without food, although you may not want too, you cannot survive without water. Everyone needs to drink a minimum of 64 ounces of water each day. Since you may need to be physically active during this period, you may need to drink even more water. Carrying two water bottles per person will minimize having to stop and harvest water frequently. Additionally, if a survival situation occurs during the summer you will need more water. Water can be extremely heavy, therefore, you need to know where to find water including how to drain water from all pipes in your home and how to collect rainwater. You also need to learn how to purify water. Click here to learn clever ways to harvest water from natural sources, as well as how to make it safe to drink. Without currency, you will need to learn ways to barter for items you need. If you are used to running to the ATM to get money, they will not work when the electricity is down. As recently seen in Germany and Puerto Rico, you may not be able to get your money out of the bank or be able to get it out in very limited supplies. Therefore, the modern survivalist needs to keep a minimum amount of cash on hand as you may be surprised what it buys you during a bug-out situation. Additionally, make sure to make a copy of all your important legal documents and keep them in a safe at home. During an emergency, you may have to prove who you are and that you belong in an area before you are even allowed to enter an area. It’s a good idea to have photo identification for all members of your bug-out party, especially in the event that you need to cross international borders. Communication is a survival essential whether you find yourself in an urban setting or in the outdoors. If you are starting to forget what it was like to live without a smartphone, or never knew, then stop for a moment and realize that during an extreme emergency, you may not be able to use any phones at all. It may be hard to get a signal in remote areas or cell phones may be useless, as with an EMP event. Your survival preparedness plan should include alternate means of communication. Additionally, depending on the situation, most radio stations and most television stations may be off the air. You will still, however, need to receive information from the outside world such as how to take shelter, what happened, and what officials are recommending that you do about the situation. Therefore, everyone should have a hand-cranked AM/FM radio. If you live in North America, then use this radio to get information from the Emergency Broadcast Network. Emergency weather radios are a vital source of information during a disaster. The Eton Scorpion II has a handcrank, solar panel, and DC adaptor for multiple power options. Click the image to view on Amazon or CLICK HERE to learn more about emergency radios. Secondly, you should consider becoming a licensed ham radio operator and connecting with others in your area that are already a part of their emergency network. For over 100 years, the American Radio Relay League has been active in almost every disaster helping people get the information that they need the most. If you are not ready to fully participate as a ham radio operator, then at least get a good battery operated scanner and learn where they broadcast in your area. The next decision that you will need to decide is what your best bet is on location. There may be times when you have no choice, but to stay where you are at the moment. If that is your home, then you need to have supplies ready to create a quarantine room. Many people are making the choice of moving permanently to a bug-out location. When choosing to buy property for a bug-out location, you need to consider which area is right for you. Many people are buying in remote mountain area because of the abundance of natural resources and the water supply. The ideal bug-out location varies depending on your current location and how you plan to meet your individual needs. Others are choosing to buy bug-out locations in the plains because food can more easily be grown there. Whichever decision you decide is right for your family, you need a comprehensive plan including knowing at least three routes to get there. While many people use GPS to get them everywhere, chances are in a survival situation, GPS is not going to work. Planning several different bug-out routes ahead of time will assist you in making the best choice when the time comes. Be aware of flooding or other obstacles that may make a route impassable. Therefore, you need to get maps of any area that you may be traveling through. While it is important to have great road maps, you may also need detailed topography maps because you may want to avoid the highways. If you decide to purchase a bug-out location, then it needs to be within one gas tank of your current location. Incidentally, you should already be filling up your car every night with a full tank of gas. For more bug-out vehicle tips, CLICK HERE. Are you prepared to handle life without electricity? If a disaster knocked out the electrical grid within the United States, experts say it would take at least a decade to rebuild that grid. Therefore, you are going to need to learn to rely on your own resources to create the power that you and your family needs. There are at least eight different ways that you can generate energy at home or in your bug-out location. The one that is right for you depends on many different factors including what things you are likely to have present in your environment. Some common choices include solar, wind, water, and steam, but you cannot wait until after an emergency occurs to get started learning to harness these forms of electricity. Solar panels are one way to increase the self-sufficiency of your bug-out location. During an emergency, you may not be able to rely on emergency services to provide even the most basic levels of protection. Therefore, it is essential to know how to protect yourself and your family. The first step in doing this is deciding which method of self-protection is right for you. Remember that you may need to kill someone or be killed. While a gun may not be the right choice for everyone, if it is the right choice for you, then there are many different choices including Mighty Barret and AK-47s down to 9 mm handguns. There are many advantages and disadvantages to each one, so make the choice that makes you the most comfortable. Never purchase a weapon that you have not been properly trained to use. If you are likely to have children around, then make sure to teach them how to safely leave a firearm alone and how to tell someone when they see a firearm improperly stored. In addition to protecting yourself, you may very well need to take care of your family’s medical needs. Again, remember that ambulances may not be operational and hospitals may not be a safe place to go. At a minimum, you may need to know how to control bleeding and treat wounds. In order to prepare for survival, you need to build a great first aid kit. You also need to know how to treat more advanced injuries. Since medical care may be set back a long way during some survival situations, it is often best to study older medical guides and know what medicinal plants to grow and use. It is not a question of if you will need survival skills, it is a case of when. Almost everyone will experience a survival situation at some time in their lifetime. Most will be caused by natural events like hurricanes, floods, snowstorms and fires. Others may be centered around man-made events caused by nuclear attacks or EMP events. The steps you take toward survival preparedness today will increase your chances of withstanding these events and rebuilding your life afterward. Richard Beck is an avid outdoorsman who enjoys hiking, camping, bushcraft and many other activities in the wild. For more information about all things related to the outdoors check out TheOutdoorsPro.com. Which aspects of survival preparedness do you find most challenging? What resources have you found most helpful? Share your experiences in the Comments section below, thanks! What Bug Out Vehicle Gear Should YOU pack? Note: This article was contributed by James Smith. Read more about him in the About The Author section below. While having the most reliable and dependable vehicle to get you to your bug out location should be high on your list of needs – the gear that you bring with you in your vehicle is much more likely to mean the difference between extreme hardship and preparedness. When packing your bug out vehicle gear it’s important to consider that your car may be a home on wheels of sorts for some time. In a SHTF situation, you will not be able to go shopping or seek medical attention and may even get stuck while you’re out driving. Wrench-in-plan situations could include having to go off-road (or take an alternate route) to avoid a bottleneck, getting lost, camping overnight, getting injured or just something going wrong with your vehicle itself. Your bug out vehicle gear should include a tire iron or socket wrench for changing the tires, as well as other tools for maintenance and repairs. You will want to make sure that you have the basic tools needed for minor repairs to your vehicle and other belongings. This can include vehicle replacement parts, tow cables, rope, straps, jumper cables and duct tape. Additionally, a fire extinguisher for emergencies may come in handy. Other indispensable items include a shovel, multitool, car jump starter (check out our favorite, The Anker PowerCore Car Jump Starter), and heavy gloves. Fuel should be treated as a finite resource so you will not want to run the engine any more than is necessary for driving. While it is tempting to crank the heat when parked, a better option is to pack extra layers and bedding to keep everyone warm. Ensure that you add a roof top cargo carrier to your vehicle and pack your extra weather appropriate clothing, shopping bags, hiking boots/shoes, and hand warmers. All of these things that will help you stay warm and beat hypothermia should you get stuck and take longer to get to your bug out location. Plan to include a tent, tarp, and sleeping bags in your bug out vehicle gear if it will take you some time to reach your ultimate destination. You probably won’t have access to these along the way so it’s extra important to conserve fuel in your bug out vehicle. Always carry multiple flashlights and various lighters, matches, and strikers. These items are essential for warmth, preparing food, and sterilizing water. You will also need to be able to see to access gear, make repairs, read maps, and scan the area for danger. Flashlights and fires make excellent distress signals that are visible over long distances, should you need to send out for help. A tactical flashlight, such as the Nitecore P12 Tactical Flashlight (pictured above), offers extra features for breaching and self-defense. To communicate with others and receive whatever transmissions are being sent, be sure to pack a radio and batteries or a reliable wind-up radio, a cell phone or prepaid phone with car adapter, portable CB radio, two-way radio, and whistle. Of course, make sure you know how to use them, and spend time practicing as much as possible. Digital navigation can be very useful but often not as reliable as a printed map. One of the most important things to stock in your bug out vehicle is proper navigation gear. Be sure you know both where you are going and all of the possible ways to get there. Prepare for unexpected detours and pack a GPS device, paper maps (both road and topographical), and a compass. Plan to keep plenty of extra water inside your vehicle – enough for you and your family to get to your bug-out location then add on a few extra liters or gallons person. It’s helpful to have a durable yet pliable water container/bladder that can be collapsed when not in use and be sure to carry water purification tablets and durable metal cups. The wide fill port makes it easy to fill and to clean the Camelbak 100oz Antidote Reservoir. Click the image to view details on Amazon. Pack and carry extra food at the rate of 2500 daily calories per person. Pack up a stove and basic kitchen as well. If you have a knack for it – and live in an area where it would be useful or practical – consider packing up a fishing kit as well. The Emberlit Stove uses wood so you don’t need to worry about storing fuel. It also folds flat, making it a great addition to your bug out vehicle gear. Click the image to view on Amazon. A proper and complete first aid kit is essential, and there are plenty of pre-packed ones on the market. They range from basic small first aid kits that include wound dressing and cleaning supplies –to more elaborate medical kits that also include blood pressure cuffs, stethoscopes, splints, scalpels, and suture kits. Get what you believe is best for your family’s budget, but remember that it’s always better to err on the side of being over-prepared than under. Also, don’t forget the toilet paper, feminine hygiene products (if needed) and any important prescription medications. Pack up flares and a good multipurpose knife. Road flares are made to burn in inclement weather, and they are easy to get going, don’t require the same finger dexterity that a finger and match does, and they burn for a really long time. If you are stuck in a dire emergency that you can’t work your fingers to light a fire flares would do the trick – and they work nicely as a torch as well. A multipurpose knife is a must-have in any vehicle bug-out bag. One top choice would be a KA-BAR Full-Size, Straight Edge – a true war-horse of a knife that many United States Marines call their one and only. A quick and easy solution to have your car stocked with survival supplies is to get a premade auto emergency kit. They serve as an excellent foundation to get your car stocked with supplies and then you can build up from there by adding any additional items you see fit. Pre-made car kits are a helpful (and economical) starting point for building your bug out vehicle gear. This kit from TopGear includes jumper cables, work gloves, basic first aid, and much more. Click the image to view a full list on Amazon. We recommend the Always Prepared 65-Piece Roadside Assistance Auto Emergency Kit. Depending on your route and possible hiccups native to your unique location and geographical area you may want to consider any additional water and land specific needs. These might include packing up life jackets, life rafts, paddles, off-road tires, ice scrapers, and wrenches. Also, ALWAYS make sure you have a car jump starter with you. It can easily save your life! Check out my favorite jump starter, The Anker PowerCore Car Jump Starter. It can even charge your phone or other devices! Planning ahead for any unforeseeable situations can save you a lot of headache figuring out what to do to solve the problem in the moment. Being well prepared with the bug out vehicle gear you need will give you the peace of mind that your whole family deserves. James Smith is a survivalist, who loves to write about survival skills and techniques. He has extensive knowledge about different survival kits and other survival supplies which he loves to share with others by writing blog. Follow him on twitter @jamessmith1609. Is a bug out vehicle part of your survival plan? Do you have one stocked and ready to go? (We’d love to see photos!) Share your tips and ideas in the Comments section below, thanks! It’s one thing to have everything you need prepared and ready to go in case of disaster; it’s quite another to know exactly what to do and to stay calm under pressure. In a disaster, what you do in those first crucial moments has a lasting impact on your long-term survival. However, preparing for survival and actually surviving are two very different things. To improve your chances of survival after bugging out, we’ve prepared a list of priorities to help you plan your long-term survival strategy and ensure you’re ready for life off the grid. Once you and your party have arrived to your designated bug out location, the first thing you want to focus on is ensuring the area is still a safe place to spend the night. Check out your perimeter and, if you haven’t already, sketch out a rough map of key area features. Find a decent vantage point that allows you to get your bearings and view the surrounding area, making note of any bodies of water, visible trails, roads, and train tracks. Carefully assess whether it is safe to remain at your chosen bug out location. Another important sign to look for is evidence of other travelers; you chose your bug out location because of its desirable features, perhaps other bug out parties have as well. Key indicators to look for include man-made items along the trail to your bug out location, rising smoke, and bright colors indicating tents or tarps. Additionally, listen carefully for footsteps and voices, especially if you fled a nearby disaster. At this point, simply having knowledge of any persons nearby and being able to keep tabs on them without divulging your location will suffice until you have addressed the second priority, assessing health. However, if you have the means, consider setting up a trip wire around your camp before settling in for the night. Using glowsticks and mousetraps, you can build a simple, yet very effective, security system such as this one. Assessing the health of your bug out crew is of utmost importance; skipping a full evaluation can lead to severe problems down the road so make sure your assessment is thorough. In a survival situation, overlooking or ‘braving through’ a condition can threaten your long-term survival – as such, all injuries should be accounted for and treated accordingly. If the size of your bug out crew permits, this assessment can be performed at the same time as your perimeter search. Even minor cuts can become a major problem if they become infected, so making sure everyone in your party has arrived unscathed is an important step. Of equal importance is immediately tending to any cuts or wounds crew members may have suffered to increase the chances of quick healing. If you’ve determined there are no pressing medical issues, scan everyone for minor injuries and ticks. Additionally, once you take off your packs, be sure to properly stretch in order to alleviate any soreness, and drink water to replenish lost fluids. Your survival after bugging out greatly depends on your health and that of everyone in your group. If there are any injuries, prioritize treatment based on severity, starting with the least severe. While it may be tempting to treat the most severe injury first, tending to those with minor injuries first will then allow them to assist with others. Also, patching up small cuts can prevent passing bloodborne infections. However, sequencing for treatment is always a judgment call; if a member of your crew is having difficulty breathing or experiencing severe bleeding, they should be tended to immediately. To assist in situations where bug out crew members are injured, we recommend adding CPR and first aid training as a measure of preparedness. Additionally, always keep a first aid manual with your bug out gear as this will help when trying to administer treatment under stress. The emotional toll of bugging out can be just as debilitating as physical injuries, and many mental effects won’t manifest themselves until you’ve reached safety. As the adrenaline cools and the reality of what you’ve just endured and the fact that you may never go back to your old life start to sink in, fear and anxiety can take over. Many people will start to wonder about the safety of loved ones and friends that are not with them and stress about their whereabouts; additionally, for those in a disaster situation, there may be extreme images that play through crew members’ minds. This can be a lot to take in at once, keeping everyone calm and minimizing discussions of the events will help your group focus on the tasks at hand. Arriving was an important step, but there is still work to be done in order to survive. Bugging out with children can present its own set of emotional challenges. If there are children in your bug out party, make sure you designate a caretaker adult ahead of time who is able to comfort them and display a positive attitude. Older children can be kept busy with tasks such as gathering firewood or kindling and retrieving other items to help with camp. The better prepared your children are ahead of time, the better they will be able to handle the rigors of survival after bugging out. The way you carry yourself and your demeanor makes a huge difference as even very young children can pick up on your stress level; by maintaining a level head and staying calm, you will benefit everyone in your crew. Once you have secured the area and all injuries have been stabilized, your next priority should be to find out what’s going on by pulling out your emergency radio. Emergency broadcasts will provide you with current information and potentially the extent of the damage in a disaster scenario. 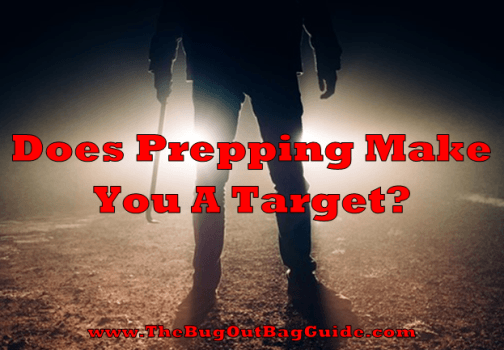 This information will help you to better assess whether or not to stay at your bug out location as you will be aware of potential impending threats (such as bombings) or the scope of a natural disaster. If cell phone use is an option, you may be able to check in with loved ones to help alleviate some anxiety. However, should you be unable to reach anyone, don’t panic. Communication lines are often overwhelmed in the aftermath of a crisis; you can always check again later. If your cell phone is still working, preserve battery by only turning it on a few times a day for short periods. There is no guarantee of what time of day or year it will be when you bug out; the more you plan ahead and establish roles, the smoother the process will be. To properly set up camp for survival after bugging out, you will need to choose spots for your fire and shelter, assemble your fire and shelter, make arrangements for hygiene, and safeguard your food rations against wildlife. There are many options for bug out shelters; carefully assess the weather and conditions in your particular locale to choose which type is best. To learn about simple shelters you can build, CLICK HERE. Whichever means you choose, try and utilize natural structures for shelter and concealment, and locate the fire pit centrally in order to keep everyone warm. No tent? No problem. There are lots of ways to build a simple shelter. After establishing the locations for your shelter and fire, it’s time to start building your fire; this way, you can use the light from the fire to continue building or setting up your shelter. As a prudent measure, you should include at least two means for starting a fire in your bug-out bag; however, should you run into problems, here are six ways to make fire without matches. At night, the light of the fire is less visible if you recess your fire pit. One consideration for setting up your fire is whether or not it is visible from far away; if giving up your location puts you at risk, try to keep the fire small and obscured by brush (at a safe distance) or possibly wait until after dusk when rising smoke will be less visible. Designate an area to serve as a bathroom that is downhill and 200 feet away from your main camp area and any water source. Digging individual catholes will work for smaller groups over a short period of time, but for a larger group, a latrine may be your best option. To build a latrine, dig a six-foot trench that is about eight inches deep and use every inch from one end to the other, covering waste with soil as you go. When all the space is used up, you will need to choose another location as concentrating too much waste in one area decreases the decomposition rate and attracts wildlife. Once the immediate needs have been met, you can start planning for long-term survival after bugging out. Another big attraction for wildlife: Food. Make sure to secure your food rations out of reach of animals. For a simple bear bag method, tie a 10-inch stick to the end of a rope and toss it over a high branch and then tie a bag with your food supply (and any other items that might smell tempting to animals) at the other end. Hoist the bag at least 15-feet off the ground and then secure the end to the trunk of the tree with the stick. This branch was ideal for our bear bag because it was high off the ground and away from other branches. Close up view of how the bear bag strap was secured to a nearby tree trunk. If you’re wondering why finding a water supply is lower on the priority list, we assumed that you bugged-out with a 72-hour water supply as well as a means of purifying found water. If this is not the case, you may want to improve your bug out preparedness or move finding a water supply up to a higher priority. When choosing your bug out location, you undoubtedly chose somewhere near a body of water; however, no matter where your water comes from, always be sure to purify any water obtained in nature to prevent contracting a parasite. If there is no water source near your bug out location, or it is unsafe to approach existing water sources, there are several ways in which you can harvest water from nature. Intestinal parasites, such as giardia, can have devastating effects. Always purify drinking water! Different ways to harvest water include tapping into trees and plants (think sap), collecting condensed water in a transpiration bag, and digging for water in geographical low points by looking for key indicators such as lines of shrubs. For more details on these and several other ways to harvest water from natural sources, please CLICK HERE. When bugging out, the supply of food you have on hand no doubt consists of MREs, high-density protein bars, dehydrated foods, and other items that are light and easy to carry. While these can be great sources of nutrition, try not to deplete your supplies too quickly – survival is not a three-meals-a-day holiday. Ration your packaged food to last as long as possible to give you enough time to figure out a food source. Image via JaseMan on Flickr. To get an idea of the amount of calories each of the members of your bug-out crew will need per day, check out this table that details the minimum daily caloric requirements for men, women and children. Keep your energy up with high-calorie protein bars. Image via Richard Masoner on Flickr. While children may have lower daily caloric needs, they will suffer from lack of calories sooner; feed children more frequent ‘meals,’ but keep those meals small. When rationing food supplies, keep in mind that you have not yet secured an alternate food supply, which brings us to the seventh priority: Finding food. The time to start looking for food is as soon as possible, not when your supplies are low. You never know how long it will take you to find a food supply and should it take some time for success, your food supply may run out. There have been entire books written on how to scavenge for food in the wild, and we here at The Bug Out Bag Guide have covered the topic several times, including in our article Bushcraft Skills: Foraging for Food. One of the easiest ways to forage for food is to look to the plants and foliage all around you. Plants do not provide the same caloric value of meat or fish, but they do have a variety of nutritional benefits. Make sure to study your local edible plants and learn how to identify them in the wild before bugging out. Small game can be caught quite successfully in forested areas by setting traps. In particular, squirrels and rabbits tend to be abundant and can be easily caught using simple snares. Always ensure you mark the location of your snares on a map and check each one frequently; a struggling animal will attract attention from predators who may steal your meal before you even know it’s there. A deadfall trap is a simple yet effective way to catch small game. Traps, such as funnels or corrals, can also be set to catch fish by placing the traps along the bank of a stream. Depending on your skill level and the type of weapons you have available, hunting for larger game may also be an option. Inlets lend themselves well to building a corral for trapping fish. Remember, the greater variety of methods you have in place for finding food, the more likely your chances of catching it! Once you’ve put in the hard work of getting your family to safety and ensuring you have the supplies needed to survive, it’s time to focus your attention on keeping your family, gear and supplies safe from predators and thieves. Be prepared – you never know who might stumble into your camp! The first step in defending your camp is to set up a watch, ensuring someone is on the lookout at all times. Additionally, you can use thorny brush to build a fence around your camp to keep both human intruders and predatory animals out. We also mentioned setting up a perimeter fence around your camp in order to keep intruders out; now is the time to decide what to do about it. If the intruder is an animal and you are equipped to take it down, that could be an easy dinner for your crew; however, with larger game, unless you have a suitable weapon at hand, you are better off to try and scare it away than risk injuring yourself. Your group will also need a strategy to handle human intruders. Each situation should be evaluated reasonably; arming yourself with weapons and defensive tactics to protect against attackers is a smart move, but not every person you encounter will be out to get you. The most important thing to remember after bugging out is to stay positive and calm. Keeping a level head will help you to better handle all the tasks necessary to establish your bug out camp. Foster communication and cooperation within the group so that you work together as a team and always be open to new and creative ways of completing tasks. Having your main tasks prioritized beforehand is an excellent way to ensure you’ve covered all the critical bases and that you are not expending unnecessary energy. Do you agree with our prioritization of tasks for survival after bugging out? Is there anything missing that you feel should be addressed immediately after bugging out? Do you have any tips to share from your experiences setting up camps? Share your thoughts and questions with us in the Comments section below, thanks!